Today we did the 7.5 km walk around Namsan Mountain. Namsan is a large mountain right in the middle of Seoul, with a radio/TV tower on the top (called, somewhat counterintuitively, “the Namsan Tower”). Along with a number of other mountains and large hills that dot the city, it’s not developed and is both “lungs” for the city and a phenomenal amenity with walking paths, hiking trails, exercise areas, etc. We got an early start, leaving the house just past 7, and were there & parked by 7:30. It was a good day for it — nice temperature, air fairly clean, but a bit hazy… have to come back again in a month or two, when with luck it’ll be nice & clear. On October 26, 1909, he assassinated Itō Hirobumi, a four-time Prime Minister of Japan and former Resident-General of Korea, following the signing of the Eulsa Treaty, with Korea on the verge of annexation by Japan. Ahn was posthumously awarded the Republic of Korea Medal of Order of Merit for National Foundation in 1962 by the Korean Government, the most prestigious civil decoration in the Republic of Korea, for his efforts for Korean independence. After a couple of abortive starts (“no, I don’t think it’s this way”), we got going, heading south towards the library (down from the circle, on the map above). The first stretch, from there to the base of Namsan Tower, was very pleasant — shady, a nice pedestrian walkway next to the service road, very little traffic (and most of that was the Namsan buses, which are powered either by electricity or compressed natural gas). At the top, the road cuts through the city wall, with the bus terminus in the gap. You have to walk the last little bit to get up to Namsan tower (but we didn’t, saving it for a clear day). Very nice views along the way up, and also as we headed on past the tower — the walk had really only just begun. Below, I’ve a couple of short video clips showing the views in a way that (I hope) will be more vivid than a picture. At a certain point, you turn left onto a pedestrianized bit, which is where the “south” route (that we’d started with) ends and the “north” route begins. It was a bit different, both wider and with one full lane of springy red surfacing (not surprisingly, that was where the many runners tended to go). We stopped for a couple of minutes just after the turn onto the North route, and found ourselves at Muscle Beach. While there are a lot of exercise areas (including a very large one just a few minutes further along), this one was unique in having serious weightlifting equipment, including large full-body mirrors. And, indeed, as he finished his workout, one of the muscle-builders there looked in the mirror, flexed his muscles and let out a big grunt! Just around the next corner was the end of a race, with boxes of drinks & some men with stopwatches, and from then on we were passed by large numbers of runners. While the one’s we’d seen there were stopping, there were a number of runners who passed us at least 2 or 3 times (e.g., one was a blond Westerner dressed in black; standing out as he did, we noticed him 3 times certainly). There was also an archery school, which had been established there in the 600’s and had been reestablished on the same spot a few decades ago. From that point, it was around 3.5 km, so we’d passed the halfway point. The walk continued very pleasant — not too steep (but often going up or down), generally shady, with a (man-made) brook running next to the road for a lot of it. There were little parks in the culverts, and occasional lookout points. When we were almost back to the Patriot Park, there was a nice looking little cafe / restaurant, less than 500 m from the parking. Looked like a nice place to stop for a light snack and refreshing drink after a walk, but sadly was not open yet (at this point, it was almost 9:30am, the walk ended up taking just 1:45 including stops to look at the views but not counting our flaffing about at the beginning). 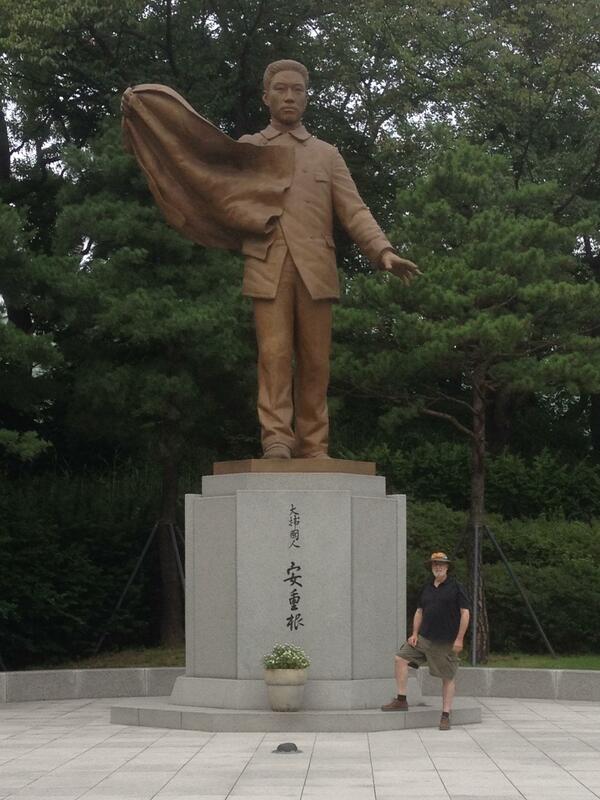 So we kept on back to Patriot Ahn Jung-geun Memorial Park, to our car and then on to home. Here are the two videos with panoramic views and, below that, copies of all the pictures and a few more besides. Electric bus. “Fill ‘er up” Love the way the “hose” looks like a real petrol hose. Badminton court next to that cafe. Planning! Back at Patriot Ahn’s park. Fine collection of steles. Had to go get another wireless router today, as one of the ones at home has given up the ghost. 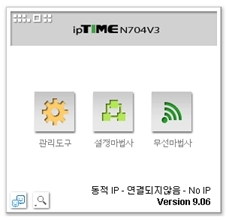 Since they’re so prevalent in Korea, and since I have a WiFi Extender of the same brand, I bought an ipTIME model N704-V3. Now, I want to change the name — I already have an “ipTIME” router — and ensure that there is no encryption (a whole ‘nother discussion possible on that!). First thing: turn off the wireless router in my office: it’s the other “ipTIME”, and I don’t want to mess with it. Plugged it in right out of the box and hooked it up to the laptop with an Ethernet cable. Open the browser, go to 192.168.0.1, and we get the default ipTIME maintenance menu. Click on the yellow gear button and we’re off. 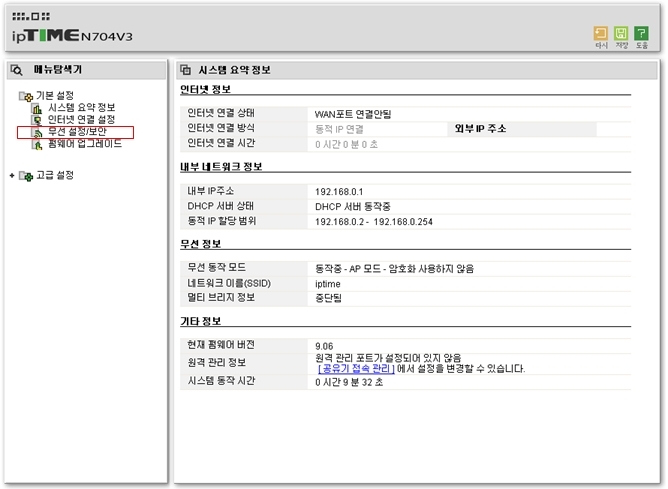 The third menu option is what we want to change the name and check the encryption. First, change the name to something else (I’m fond of characters from P.G. Wodehouse novels for this). 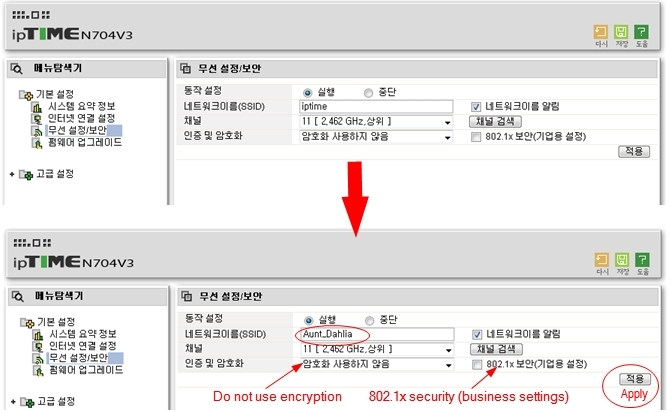 Then, check the encryption: it’s already by default set up not to use any encryption. If you click on the box that I’ve conveniently labelled (“Do not use encryption”) you get a dropdown menu with around a dozen choices. I’m not sure whether you also need to check the box to the right (also translated in the screenshot), but probably. Finally, click on the “Apply” button to save the settings. Now I have to unplug the ethernet cable from the new N704-V3 wireless router and plug it into my ipTIME wifi extender, and reset that to use the new wireless router. Fortunately, I wrote up instructions for that around a year ago. And now we are done! Assuming, of course, that it all plays nice when I take it up stairs and plug all the bits in & turn them on. What could go wrong…? Nice to be able to see Seoul again! Some months ago, I started making yoghurt, as the yoghurt here isn’t much to my taste. Except for 1 brand, all the yoghurt is sweetened. And “the good stuff” both isn’t great and is often sold out (no surprise, I think to myself…). So I found a yoghurt maker (that was a surprise) and got started. I let it stew in the pots for a very long time, and it comes out fairly tart. I’ve changed my technique since these pictures were taken in May: now I put a half a teaspoon of my starter yoghurt into each pot, and disolve the rest into the milk before filling the pots. … and the starter, from the last batch. Warm up the milk. Watch that temperature! Last weekend, we dropped in on the neighborhood of Hongdae, which is quite close to That Girl’s school, quite well known “in the expat community” and hitherto quite unvisited by us. 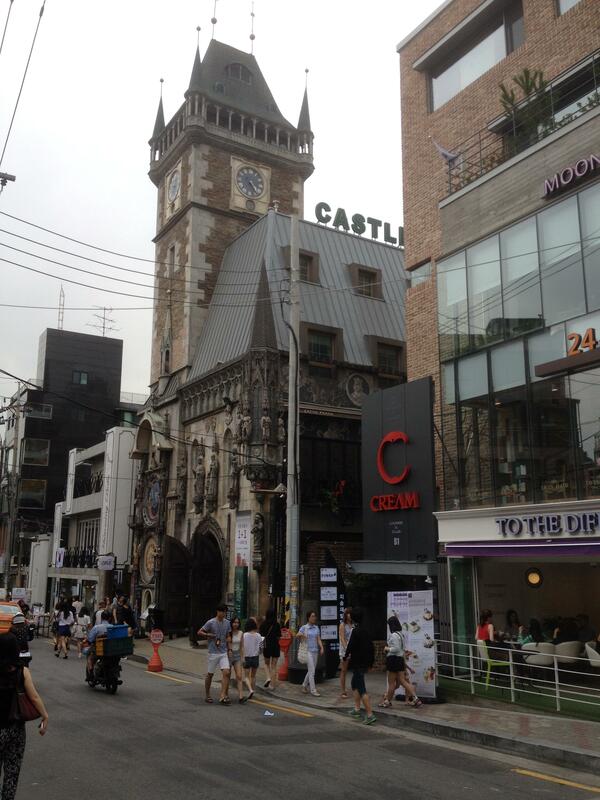 Hongdae (홍대) is an abbreviation of Hongik Daehakgyo, the Hongik University (홍익대학교). We parked at the north end, and walked south, to our objective: the KT&G Sansang Madang, which was supposed to be some sort of modern art museum. Another objective was the Free Market, where for 10,000 won (around 7.25 euro or $10) you can rent a stall — supposed to be a quirky selection of often handmade stuff, but it wasn’t really going when we passed by. Maybe next time we’ll go in the evening… might just be a better time! On the way there, we ran across the incongruous Castle Praha, a brew-pub / Czech restaurant / souvenir shop, which while totally fake really did seem like an ancient central European town hall for that first moment. What a laugh! But I must return to try its beer. The KT&G however was open: the ground floor is a design store — all sorts of fascinating things, real “toys for adults” territory — the museum is one flight up, and the top floor is a restaurant. 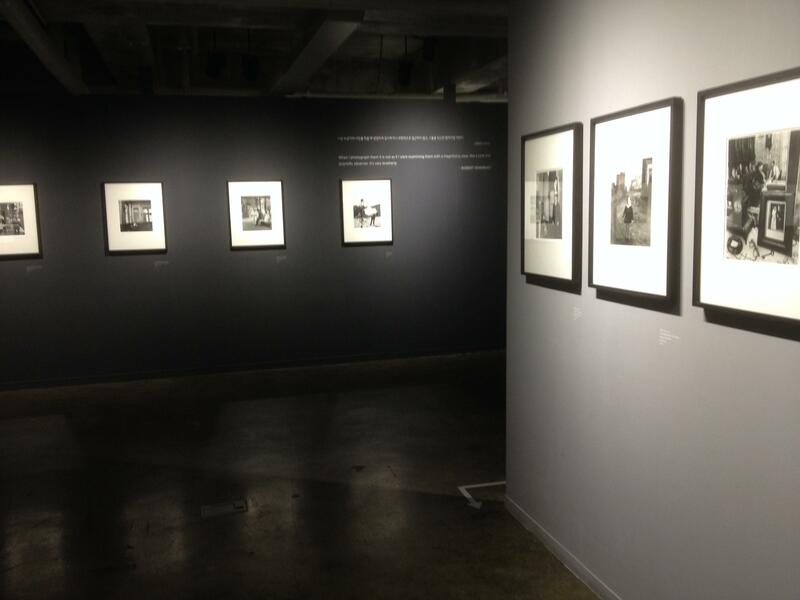 And that flight up was worth it: an exhibit of photographs by Robert Doisneau. which I had wanted to see but thought I’d missed due to being out of town on vacation all July. So we worked our way up: shop to museum to restaurant. 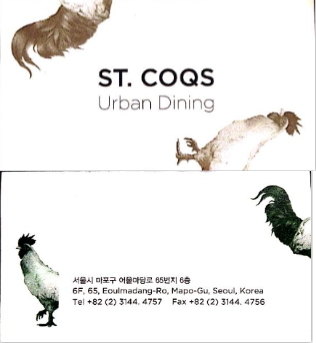 The restaurant was French, mostly serving excellent free-range chicken (which A. & I shared, roasted) but also other things (like our starter, a great caesar salad, or the seafood risotto That Girl chose). A definite place to stop for lunch in Hongdae, and I’d even drive to go there if I was already nearby. After that, we moseyed our way back to the car & home. Street food is always available in Korea. Always. NO walkabout is complete without finding an Irish pub. Seldom in conjunction with a snail restaurant, though. 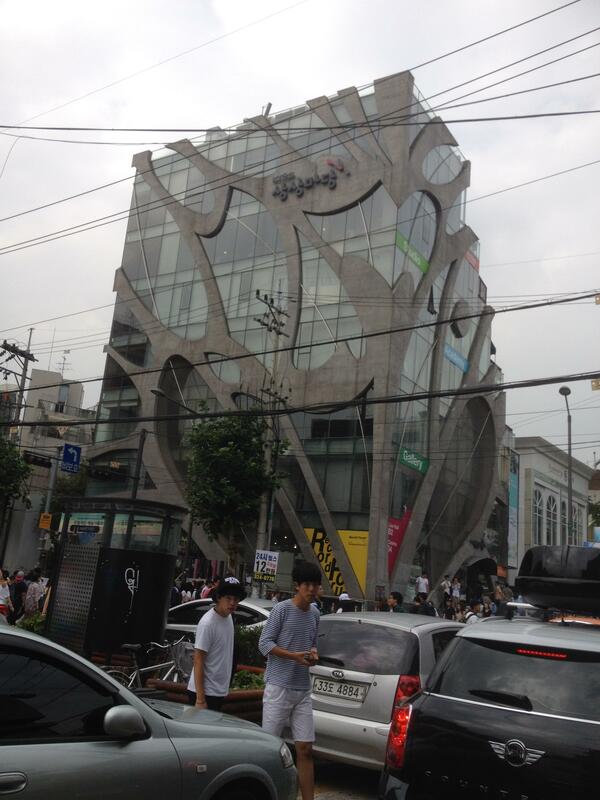 Is that REALLY a 4-story coffee shop?! ?